Twenty years after his moving story was told in the Oscar-winning film "Rain Man," Utah's modest prodigy Kim Peek, who will turn 57 on Nov. 11, is again being impersonated in an updated stage play with the same title at London's prestigious Apollo Theatre. British stage actor Adam Godley has won critical acclaim for his sympathetic portrayal of the autistic Raymond, a character inspired by Peek and played in the film by Dustin Hoffman (who won an Oscar for the Best Actor in a Leading Role). Thanks to the film and countless TV, radio and press interviews, Peek has long been the world's favorite and best-known savant (learned scholar). "Described as a confounding mixture of disability and brilliance, Kim is in love with knowledge," says the Multiple Sclerosis Web site Extraordinay People. "... Kim was diagnosed as being mentally retarded at birth, but with father Fran's unflagging support he has developed a memory that is without equal. Born and raised in Salt Lake City, Utah, Kim has lived there all of his life. The local library is Kim's favourite place in the world. Kim devours books on anything and everything, as many as eight in a day. He reads at a phenomenal rate, a page that may take you or me three minutes will take Kim about 10 seconds. He reads the left page with his left eye and the right page with his right eye and will retain about 98 percent of it. He has 15 subject areas but about the only thing he can't do is, he can't reason out mathematical problems." Another autistic savant, who can reason out mathematical problems, is Britain's Daniel Paul Tammet (29). Born in London, the first of nine children, he has written in a memoir, how having epilepsy, synaesthesia and Asperger syndrome all deeply affected his childhood. He can calculate huge sums in his head in seconds and instantaneously recognize prime numbers, but he finds emotions difficult to understand and has trouble telling left from right. He says he sees numbers as complex synaesthetic shapes with color, texture and motion. Thirty-seven, he says, is lumpy like porridge, while 89 reminds him of falling snow. Sequences of digits form visual landscapes in his mind. In March 2004, Tammet set a European record when he recited the famous mathematical constant Pi from memory to 22,514 decimal places in five hours. He has been studied by scientists at California's Center for Brain Studies and at the Cambridge (UK) Autism Research Centre, and has been described as "autism's Rosetta Stone." You can read about his life and achievements in his regularly updated blog, Optimnem. According to Wikipedia, Tammet and his domestic partner, software engineer Neil Mitchell, live together in Kent where they have a quiet regimented life at home with their cats, prepare their meals from their garden, and prefer their privacy. They operate the online company Optimnem, where they create and publish language courses. Tammet has publicly discussed his relationship with Mitchell, his savant abilities, and his sexual orientation. On the other hand, Kim Peek and his father, Fran, who is now 81, have spoken to five million people and traveled more than two million miles, sharing their story. Last Saturday, they were in Portland, talking with autistic children and their parents and friends at a function arranged by the Autism Society of Maine. 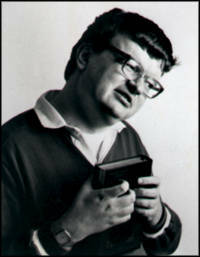 Has Utah's Kim Peek ever met Britain's Danial Tammet? Yes. You can view their meeting by playing this YouTube video. In another video sequence, Peek hugs Tammet and tells him, "Someday you will be as great as I am."